There were 347 press releases posted in the last 24 hours and 153,676 in the last 365 days. MILWAUKEE, Wis., April 16, 2019 (GLOBE NEWSWIRE) -- As our bodies and minds change with age, and frailty and memory loss threaten to separate us, the TimeSlips creative storytelling program offers hope by showing how creativity and imagination can re-connect us. To spur a creative care revolution, the newly re-launched TimeSlips.org website provides more than 300 free resources and activities in the newly expanded Creativity Center to make meaningful engagement a reality for people living with Alzheimer’s disease and other dementias, their families and caregivers, and people serving them in community-based organizations and residential care facilities. 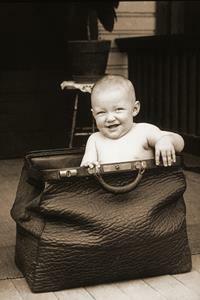 The TimeSlips creative storytelling program uses whimsical or comic photographs -- like this photo of a laughing baby sitting in a vintage carpetbag -- to spark the creativity of people living with dementia and help rebuild connection with family, friends, and caregivers by making up stories together. /EIN News/ -- Making up stories together is at the heart of the TimeSlips concept. By providing users with playful photographic and verbal prompts and questions to guide the creation of an original story, TimeSlips releases people living with dementia from the pressure to remember and replaces it with the freedom to imagine. TimeSlips models true person-centered care and has been shown to increase the quality and quantity of engagement between staff and residents in nursing homes and lead to enhanced verbal skills, positive behavioral changes, more communication, and less confusion in people living with dementia. Reflecting the strength of its evidence base, TimeSlips is featured on the U.S. Agency for Healthcare Research and Quality's (AHRQ) Innovations Exchange. TimeSlips is a non-profit alliance of artists and caregivers bringing meaning and joy to late life through creative engagement. Our core improvisational storytelling method is evidence-based and has been replicated by Certified Facilitators in 47 states and 19 countries. Our Creative Communities of Care training infuses creativity into organizations serving elders including skilled nursing, assisted living, independent living, senior centers, memory cafés, and museums. We believe every human being deserves to feel meaning and purpose, and that growth and expression is possible all the way through the end of our lives. Learn more at https://timeslips.org.